Fatigue is a common failure for any dynamic system. Our experts are skilled in assessing fatigue and use key integrity indicators to inform and quantify existing design conservatism. Our team are skilled in the use of industry leading Global Dynamic Analysis softwareand we use verified Local Fatigue software to provide accurate evaluation of the stress loadings within dynamic systems. 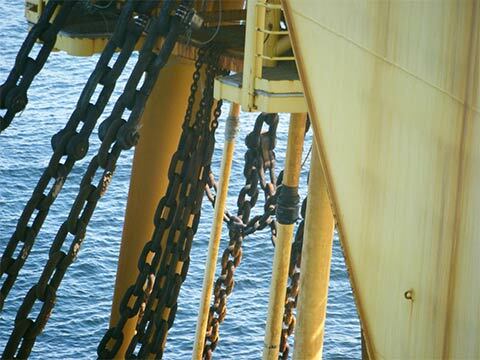 Flexlife was contacted by one of the world’s leading oil and gas companies to life extend several flexible risers. A key aspect of this scope of work was to re-evaluate the fatigue life which was complicated by the fact that one of the risers, a six-inch gas lift riser, was identified to have a large breach in the outer sheath. The risers were all located offshore South-east Asia. The riser end fittings were connected to a turret subsea, thus preventing the testing of these risers using traditional methods as would typically form an early indicator regarding the fatigue characteristics of the riser. Along with our partners, Oceaneering International, we mobilised a team and carried out detailed Ultrasonic Testing (UT) of the risers. This was done from a Dive Support Vessel (DSV) using Oceaneering’s Neptune Scanning Tool, to ascertain the extent of seawater flooding within the riser annuliand any corrosion of the metallic layers within the riser. Our campaign not only delivered the vital information to our client, but identified further breeches in the outer sheath of two risers and some serious problems with a further two risers, which had arisen due to problems with the vent systems. We proposed a solution to the outer sheath breaches by using our patented Armadillo® Repair Clamp, which, for the first time, incorporated a specifically designed venting system. We also conducted onboard testing of the vent valves and found they were severely restricted due to marine growth within the end caps. The vent valves were replaced on the damaged subsea riser and on several other subsea risers, some of whose outer sheaths had ballooned under internal annulus pressure. This was preventing a catastrophic failure of the outer sheaths and a substantial cost saving for our client. In conjunction with this extensive inspection and repair programme our experts carried out fatigue analysis using specialised global dynamic and local fatigue analysis software. The outcome of this expansive body of work provided a sound engineering basis to allow the operator to make an informed decision. As of this date these risers are still safely producing. One of our Se Asian clients had reused a legacy production riser for Water Injection service on their FPSO. 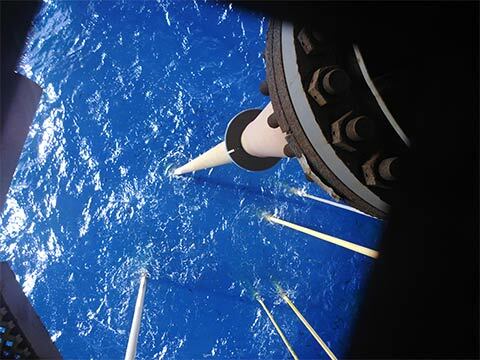 Recent riser annulus testing highlighted that the riser annulus was flooded with seawater leading to concerns regarding the remaining fatigue life and whether the riser was safe to continue operating. Flexlife skilled analysts carried out a fatigue analysis using irregular wave methodology. This factored in the actual metocean data which the riser had been subjected to during its life, also incorporating the appropriate regression parameters to reflect the riser’s current condition. The analysis was complicated due to the differing production regimes of the first production application prior to its current use for water injection service. The outcome of the analysis demonstrated that the riser is safe for continued operation, but that it will be prudent to consider replacement at a forecasted date. This allows our client to plan this change well in advance, eliminating the danger of unplanned shut-down or loss of water injection service and the detrimental effect which this would have on the field’s commerciality. All of this benefit obtained whilst maintain the rigorous approach to safety which can never be compromised.